Nikon D800, Nikon 70-300mm lens at 180mm, f/22, 1/4 second, ISO 100, polarizing filter. 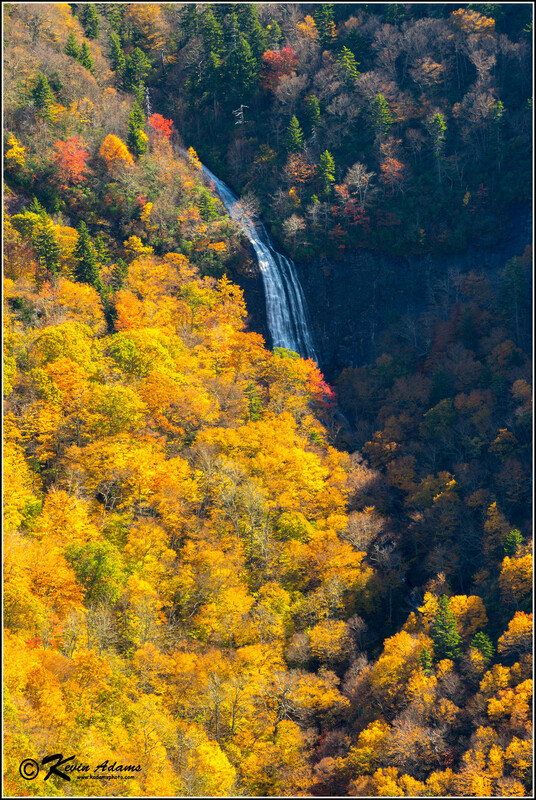 Glassmine Falls Overlook is located at Milepost 361.3 of the Blue Ridge Parkway, a few miles north of Craggy Gardens. 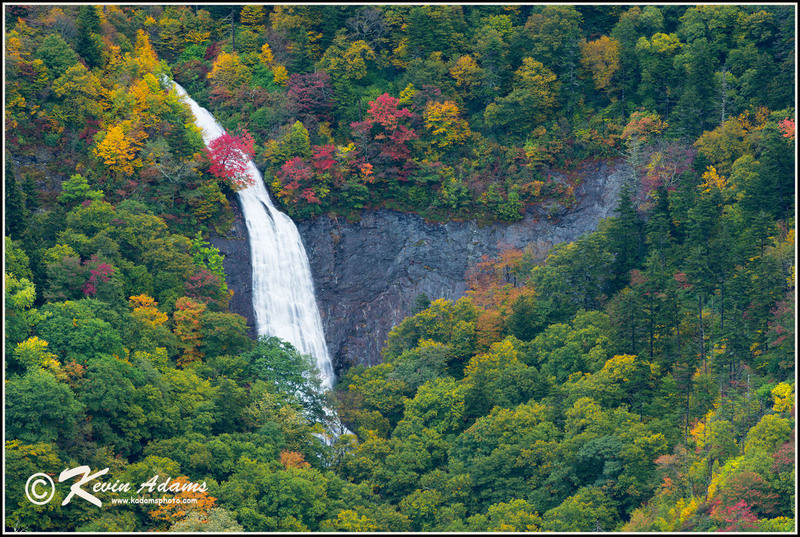 From the overlook, you can look across the gorge of North Fork Swannanoa River to Glassmine Falls on the opposite mountainside. Well, sometimes you can. Glassmine Falls is nearly ephemeral. In summer and fall, it can dry so much that you can’t see any water from the overlook. In winter and early spring, particularly after a good rain, it’s a nice sight and complements the overall mountain view well. In high water, the beauty rating is much higher. But high water doesn’t last long. You have to be there while it’s raining. 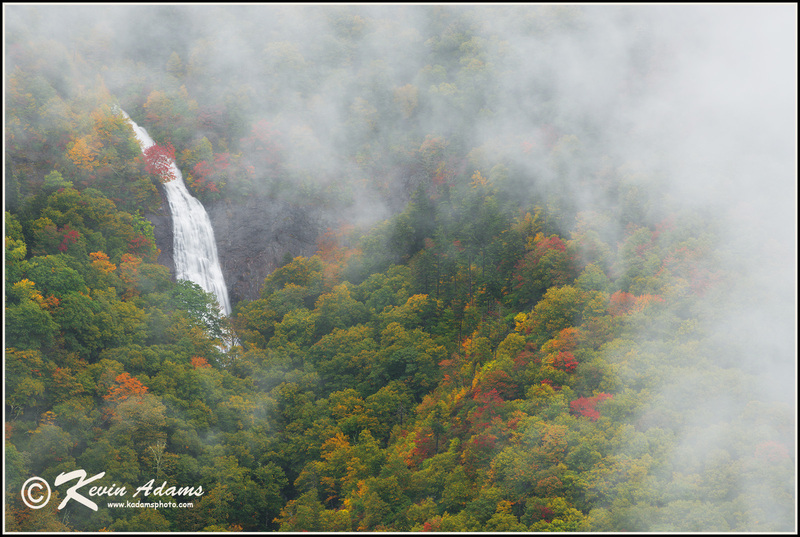 The photo rating is based on incorporating the waterfall within the overall scene. 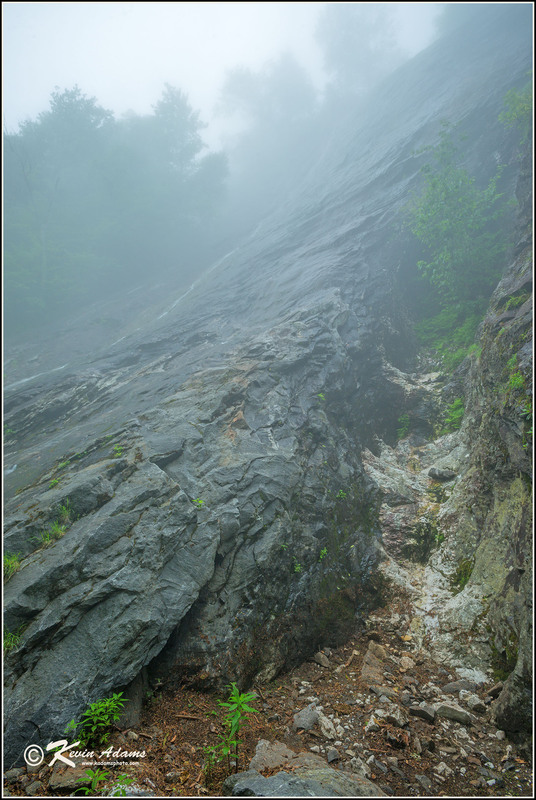 The sign at the overlook says Glassmine Falls is over 800 feet high, but the visible portion is nowhere near that. I’ve explored the falls and branch, and I have a hard time believing the waterfall is more than 200 feet high. 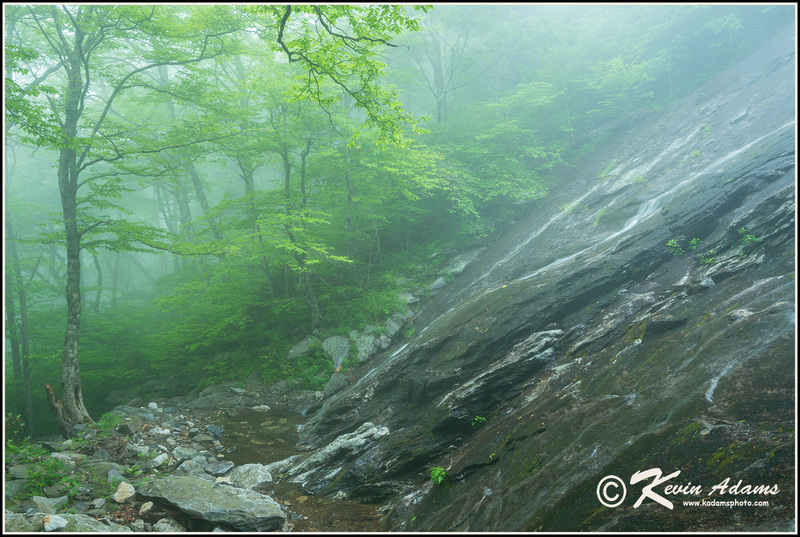 That said, it’s about 1,000 feet from the Blue Ridge Parkway (which crosses Glassmine Branch) down to the base of the falls. Most of that distance is extremely steep. 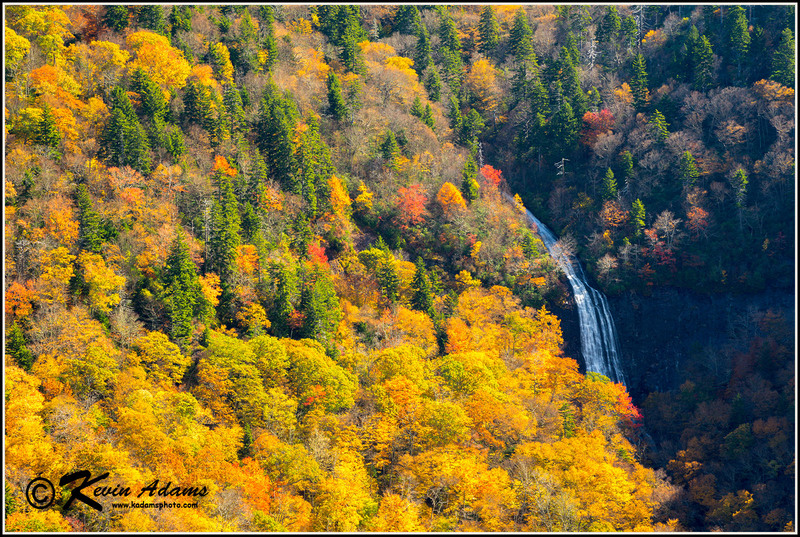 Through binoculars, you’ll see a dark spot to the right of the falls near the base. This is the old Abernathy Mine, a mica mine. The transparent mineral is also known as isinglass. 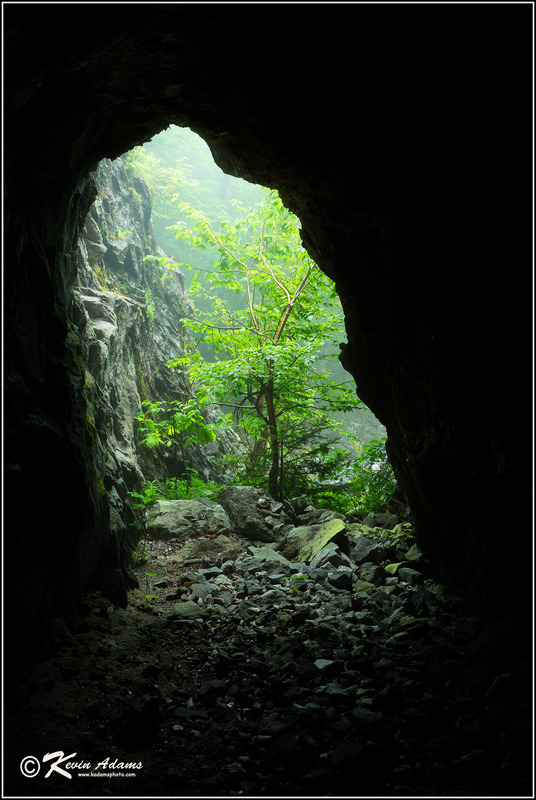 Old-timers simply called it “glass.” Numerous “glass mines” operated in the western North Carolina mountains during the first half of the 20th century. The Abernathy Mine had the distinction of being located literally in a waterfall. When the water’s up, the flow pours into the adit, the nearly horizontal passage leading into the mine. 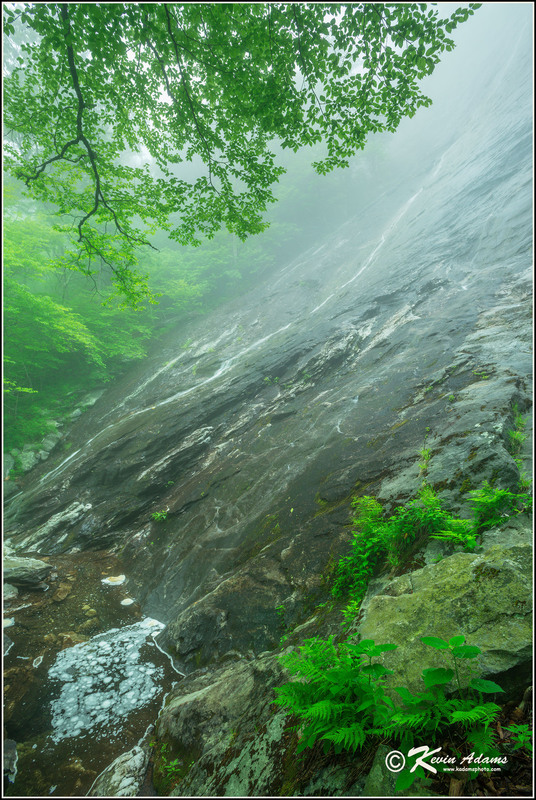 Glassmine Falls is located within the Asheville watershed, which supplies water to Burnett Reservoir for the city’s needs. Except for the narrow strip of property within the Blue Ridge Parkway, all of the watershed is off-limits to the public. The only legal way to view Glassmine Falls from the base is by obtaining special permission, which is unlikely to be granted. Nikon D800, Nikon 70-300mm lens at 170mm, f/22, 1/4 second, ISO 200, polarizing filter. Nikon D800, Nikon 70-300mm lens at 260mm, f/22, 1.3 seconds, ISO 200, polarizing filter. 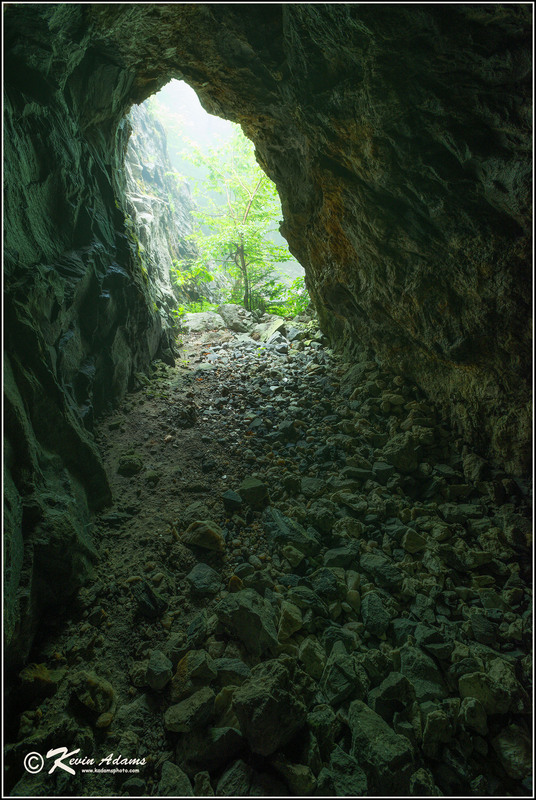 This view is from the inside of the Abernathy Mine at the base of Glassmine Falls. The base of the falls is not open to the general public. Nikon D800, Nikon 17-35mm lens at 17mm, f/8, 2 seconds, ISO 200, polarizing filter. This view is from the base of the falls, which is not open to the general public. Nikon D800, Nikon 17-35mm lens at 24mm, f/11, 0.8 second, ISO 200, polarizing filter. This view from the base of the falls shows the Abernathy Mine adit. The base of the falls is not open to the general public. Nikon D800, Nikon 17-35mm lens at 17mm, f/11, 0.3 second, ISO 200, polarizing filter. This view is from the base of the falls, which is not open to the general public. Nikon D800, Nikon 17-35mm lens at 17mm, f/11, 0.6 second, ISO 200, polarizing filter. Nikon D800, Nikon 70-300mm lens at 195mm, f/22, 1/5 second, ISO 200, polarizing filter.